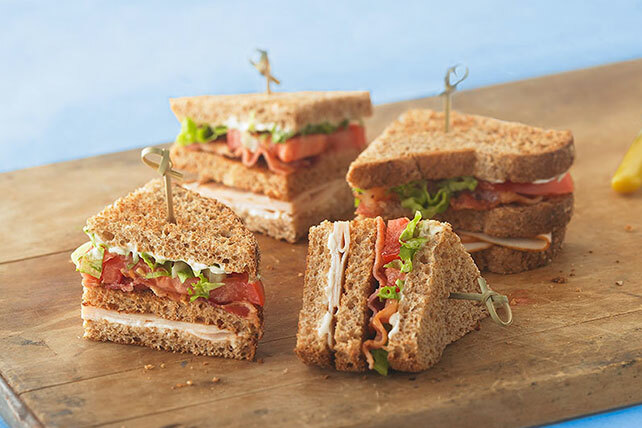 You can have this chicken BLT triple-decker club sandwich for two ready to eat in just 10 minutes. Speedy enough for you? Spread 1 Tbsp. dressing evenly onto 2 toast slices; top with chicken. Cover each with second toast slice. Top with bacon, tomatoes and lettuce; cover with remaining toast slices spread with remaining dressing. Cut each sandwich into 4 triangles; secure with toothpicks. Substitute 4 slices OSCAR MAYER Fully Cooked Bacon for the cooked bacon slices. Add 1 KRAFT Singles Select to each sandwich. Substitute OSCAR MAYER Deli Fresh Oven Roasted Turkey Breast for the chicken.